"City in the Community is a great example of how valuable sports projects are to local people." 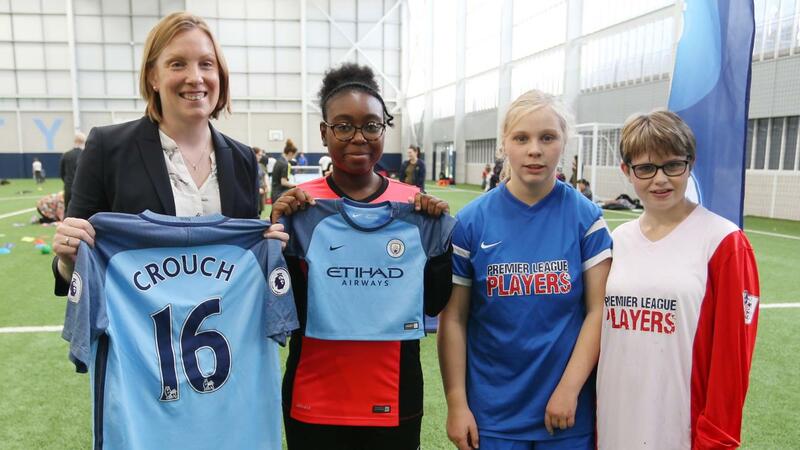 Sports Minister Tracey Crouch was speaking at an event to celebrate the 30th anniversary of Manchester City's charitable foundation, City in the Community. Crouch saw two of City in the Community's flagship programmes at the City Football Academy, PL Kicks and the One City disability project. Jamie Tregaskiss is one of the participants of One City, which is designed to increase participation levels and raise awareness of issues affecting people with disabilities. It caters for people with a variety of mental and physical disabilities, including autism, cerebral palsy, visual/hearing impairments, Down's Syndrome and wheelchair users. 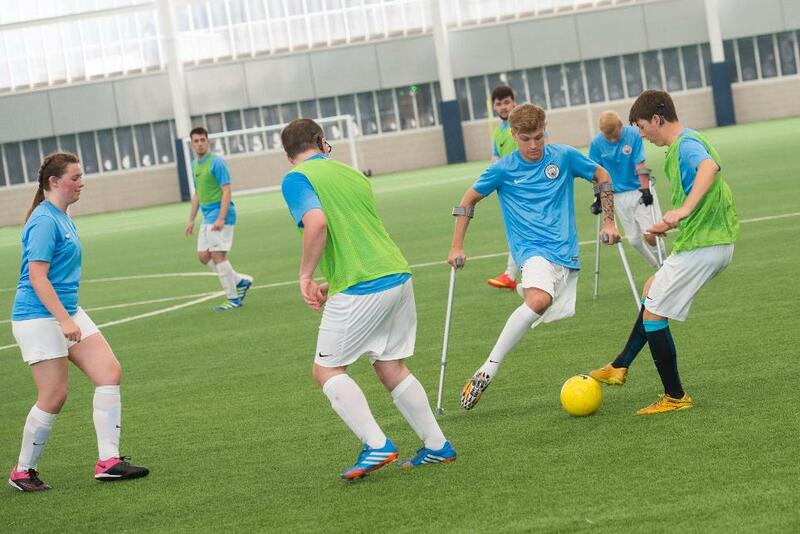 Tregaskiss lost his leg to cancer at 13 but with the support of City in the Community, has been able continue playing and is considered one of the best amputee footballers in the world, playing for Manchester City and Great Britain amputee teams. "The club's support for the amputee football team has been incredible," he said. "Investment across the disability programmes has meant that people like myself can play football every week. "Being here at the City Football Academy, on the same pitch that the first team use, makes it even more special." The programmes on show this week are just two of the many that are delivered by City in the Community, which now employs 70 employees who in turn work with 50,000 people in Manchester. BBC's Match of the Day captured another CITC programme as Bacary Sagna helped local schoolchildren with their literacy skills through the City Stars programme. "Sport should be accessible to all, and we are working hard to make sure that everyone can play and enjoy sport, no matter what background they are from and what their ability is," said Crouch. "Thousands have benefitted from the City in the Community programme and it is a great example of how valuable sports projects are to local people." City in the Community will officially launch its 30th year celebrations today when the first team take on Southampton at the Etihad Stadium. The season-long campaign that will highlight the positive impact of City in the Community over the years, feature the remarkable people who work behind the scenes to enhance the lives of so many people and host a series of fundraising events that fans can engage with. "Football has the power to engage and connect with communities in a way that inspires like little else," Premier League Executive Chairman Richard Scudamore said. "Our clubs have been doing this for years with their local communities, particularly focused on young people’s participation and development. "The impact that City in the Community has made in Manchester and beyond over the past 30 years will have been so positive for so many individuals. The fact that they are doing more than ever before and will continue to grow their work in the years to come is the real celebration of Manchester City’s commitment to their communities." City Football Group Chief Executive Officer Ferran Soriano said the club were "incredibly proud" to mark this milestone. "It will have a special place in our Club's history," he said. "Using football as a way to improve the lives of local people was the reason why Manchester City was formed and this ethos has shaped the way we have developed as a club. "City in the Community has helped Manchester children flourish in terms of health, education, social inclusion and citizenship. The passion instilled from everyone involved is fantastic and the research figures reflect this."